It has been SUCH a long time since I’ve written in my blog—but this is no worse than my personal journal writing ever was. I’m in the midst of an unusually long spell of business travel so I thought I’d write about my adventures so far. Even though I love to travel and am always ready and willing to do so (I pride myself on being ready to go anywhere in the world in 30 minutes), this has been an unusual autumn for me. It has all been business travel related to our document management systems, delivering training. 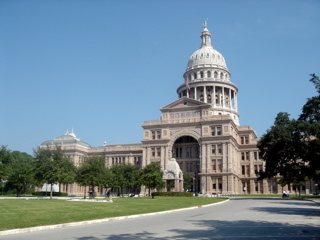 Texas State Capitol Building, Austin. I then came home for one day at the office and then off again on the longest part—a 3-city, 8-day “world tour”. Stop number one was Denver, CO, where I visited and taught at the Longmont facility. The classes were OK, but I found out too late that the training machines I was provided were missing some software I needed. I like Denver too, but it was already starting to be chilly in the evenings. One of my favorite places in Longmont is a new community called Prospect. Each of the homes and condos is uniquely designed and the place gives the image of an eclectic village. If only such a place could be built somewhere where the weather is better in the winters. The other thing I always do is treat myself to a trip to the Denver REI flagship store. It’s absolutely amazing—sits right on the river where people ride by on the bikes on the river paths or kayak in front of the store. It’s truly incredible—but this time I actually got away without buying anything! 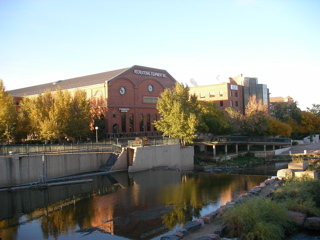 The REI Flagship store in downtown Denver. Stop number two was Providence, RI where I spent a day teaching at our West Greenwich, RI facility. We’d called ahead to get the required software installed, but ended up having to redo it anyway. Still, the classes went without a hitch. The facility there is for manufacturing, and since part of it is still under construction there were lots of workmen around and security was rather tight. Still, it was an interesting experience. 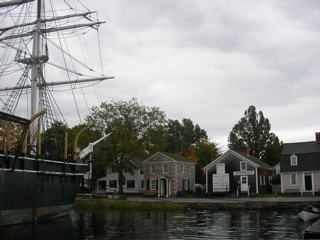 A view of Mystic Seaport. This entry was posted in USA by dpkworldwide. Bookmark the permalink.